Stray Dog Arts: "Mi Perro" :: Recent Works by Jessie Marianiello :+:+: ArtBARK! :: An Art Contest for Kids! :: YOU'RE INVITED! "Mi Perro" :: Recent Works by Jessie Marianiello :+:+: ArtBARK! :: An Art Contest for Kids! :: YOU'RE INVITED! Tierra de Animales in Mexico. Where...oh, where to begin?! It has been an incredible 9 months filled with incredible amounts of travel. This past February, a spontaneous invitation to take a trip to Mexico ended up being just the beginning of a willingness to say YES to a whole new way of living, working and interacting with both the world and my art. Little did I know, at the time, how the experience was pulling me deeper, leading me on a global adventure and criss-cross pattern across the nation. You see, it often feels as though I am being pulled by a mysterious silver thread, each experience connected to the next (...and the next and the next). I've been feeling that way for quite awhile now, but these days I'm starting to see that pull play itself out in some pretty interesting ways. The thread that I speak of is equally tenuous and tenacious, requiring a depth of intuition that I've learned to trust with my entire being. I feel infused. Fueled. Ready to dive in and see where life is taking me next. No doubt, it is bound to be an interesting journey. I can barely remember a time in my life when I felt so ENGAGED, so saturated and satisfied. In these past several months, I've spent time with stray dogs in Mexico, with street cats in Morocco, and helped rescue a dog we nick-named Lady Magdalena in Spain. I've sat with herds of wild horses in the mountains of Wyoming and watched dust being kicked up by the thundering hooves of horses in New Mexico. En route, I've met a hundred gorgeous people along the way. To say these experiences have changed me would be an understatement. I've been turned inside out--and have come to find that I rather like it that way. And now? I am back in my northern studio. Painting and painting and painting in preparation for a solo exhibition in honor of the Mexican street dogs that I met this past February. I am painting with my whole heart and, without a doubt, I know that I have found a true calling. I am grateful to have you along with me on this journey. 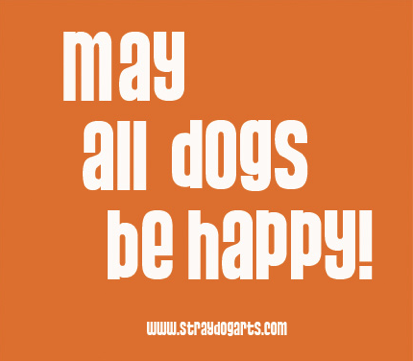 This is meaningful work and it is truly an honor to be able to share the beginnings of what is turning into a growing project of working with stray animals around the world. I will be donating 50% of all original "Mi Perro" painting sales to Tierra de Animales in an attempt to help them continue doing the incredible work they do. 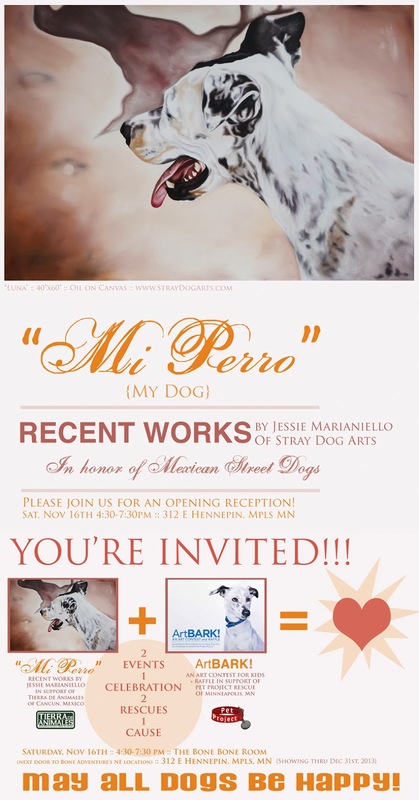 The "Mi Perro" event will be happening in tandem with ArtBARK!, an art contest for kids and raffle in support of Pet Project Rescue. Save the date, my friends! 2 events, 1 celebration, 2 rescues, 1 cause! Please join us for an Opening Reception & Celebration!